Mansfield, 55 vs. Medfield, 39 – Final – Julianna Newell scored 15 points to lead the Hornets to a win in the MIAA Tip Off Showcase, which raised money for the Joe Andruzzi Foundation. Caroline Maher added 13 points for Mansfield while Jen Peel had eight points and six assists and Meg Hill had eight points and 11 rebounds. 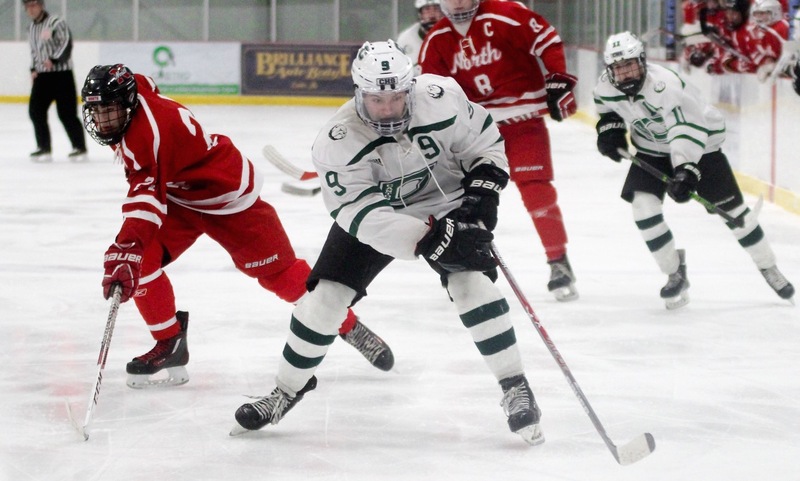 Milford, 1 @ Stoughton, 5 – Final – Mark Sheehan scored twice, Jon Lessa had a goal an assist while Ryan Chipman, Barry Cooke, Carter Gerome, Eoin Doherty, Donnie Foley and Nick Hardy all recorded a point in the win. Milford’s Griffin Burns scored off an assist from RJ Stansbury. Oliver Ames, 5 vs. Quincy, 2 – Final – Five different players scored – Matt Mancini, Jared Costello, Jack Maloney, Evan DiMartinis and Max Ward – to lift the Tigers to a season opening win. Mt. Hope Tournament (Franklin, Stoughton) – Franklin’s A squad finished in second place at the tournament. Devin Ness Memorial Tournament (King Philip, Oliver Ames) – Oliver Ames’ Shea O’Connor and Pat Mills each won at their weight class as the Tigers finished in fourth. King Philip finished in sixth. Lincoln-Sudbury Quad (Mansfield) – The Hornets broke even, going 2-2 on the day. Tewksbury Quad (Milford) – Milford went 3-0 at the Tewksbury quad with Ryan Nesta, Ryan Gray and Nick Johnson each going 3-0. North Attleboro Quad (North Attleboro) – North Attleboro went 3-0 on the day. Sharon Quad (Sharon) – Sharon went 3-0 on the day with wins over Pembroke (53-30), Plymouth North (42-36) and Walpole (42-39). 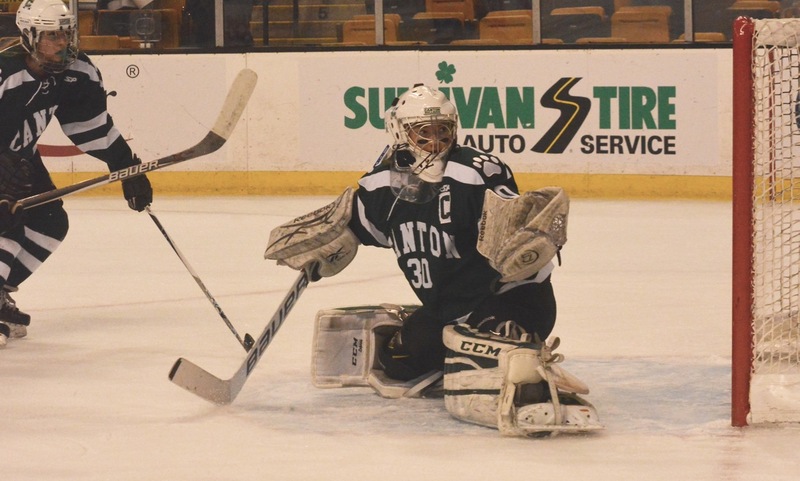 Norton Quad (Taunton) – The Tigers went 2-1 with wins over Durfee and Nauset. Justin Bradley (126), Jorge Rodrigues (138), Nuno Camara (182) and Santiago Lopez (220) all went 3-0 on the day. Attleboro, 44 vs. Franklin, 55 – Final – Franklin got first place finishes from Luke Gordon (38.35) in the 300M and the high jump (league best 6-01.00), Jimmy Robbins (2:51.40) in the 1000M, Paul Kroushl (1:34.50) in the 600M, Ryan Spelman (4:44.39) in the 1 Mile and both the 4×200 and 4×400 relay teams. Attleboro was paced by first place finishes from Isaiah Rodrigues (6.87) in the 55M dash and in the long jump (18-10.25), Brett Szlachciuk (10:47.38) in the 2 Mile, Jacob Hardy (league best 50-05.00) in the shot put. Attleboro’s Patrick Collins (44-07.50) and Nathaniel Joyal (41-08.50) finished second and fourth, respectively, in the shot put. Canton, 23 vs. Sharon, 73 – Final – Sharon’s Oliver Hu was first in the 55M dash (league best 6.84), Matthew Hoffman was first in the 300M (39.93), Tieqi Sun was first in the 1000M with a time of 2:57.61, Tianrui Sun (league best 4:44.08) was first in the 1 Mile, William McManus was tops in the 55M hurdles (league best 8.20), both 4×200 and 4×400 relay teams were first and Carlos Grullon had a league best 20-03.00 in the long jump. Canton’s Patrick Hession was first in the 600M at 1:30.14 and senior Mark Clancy was first in the 2 Mile at 10:38.87 (PR and state qualifier) and second in the 1 Mile at 4:47.32. Foxboro, 61 vs. Stoughton, 39 – Final – Foxboro’s Hunter Williams finished first in the 300M at 41.27, Danny Rounds came in first in the 600M at 1:37.09, Will Regan (2:54.85) was first at the 1000M, Alton George (37-03.25) and Jack Lovely (36-11.00) were first and second in the shot put and Eseosa Omuemu was first in the long jump (19-01.50). For Stoughton, Clifton Gerring was first in the 55M dash at 6.96 and first in the high jump at 5-05.00, Cameron Bean was first in the 1 Mile at 4:50.84, Colin Cochran was first at the 2 Mile at 11:23.87 and Alexander Oliver (8.74) was first in the 55M hurdles. King Philip, 39 vs. Taunton, 61 – Final – Taunton’s Brian Cherenfant ran away with the 300M with a league best time of 37.31 and finished first in the long jump at 18-06.75. Matthew Holt (38.59) finished second in the 300M. Jimmy Hoye (1:31.24) was first in the 600M, Zac Bentley was first in the 1000M at 2:48.28, Dylan Lynch (4:48.81) took first in the 1 Mile, Trevor Wysong (10:16.48) was first in the 2 Mile, Lance Law was first in the high jump at 5-09.00. King Philip’s Sean Garrity was first in the 55M dash at 6.85, Ethan Dunne was first at the 55M hurdles at 8.38 and Paul Macrina came in first at the shot put at 43-03.50. Mansfield, 62 vs. North Attleboro, 38 – Final – Devin Maughn was first in the 300M at 37.95 for Mansfield, Kyle Amerantes finished first at the 600M in 1:29.18, Jack Crawford (2:43.92) and Kevin Crawford (2:45.73) were first and second in the 1000M, Nick Rispoli (4:48.77) came in first in the 1 Mile, Jake Affanato recorded a league best time of 10:14.17 in the 2 Mile, Jareme DiLorenzo came in first in the 55M hurdles (8.25) and Kevin McCree was best in the shot put at 40-02.75. North Attleboro’s Nick Rajotte finished first in the 55M at 6.92, both the 4×200 and 4×400 teams came in first, Matt Tarantino was first in the high jump at 5-11.00 and John Thompson was first in the long jump at 19-04.50. Milford, 28 vs. Oliver Ames, 72 – Final – OA’s Doug MacDonald topped the 55M race at 6.94, Belmund Rodrigues-Pires finished first at the 300M in 37.59, Michael Braga was first in the 1000M at 3:01.60, Jarod Boone (4:45.23) finished in the first spot in the 1 Mile, Troy Kent (10:44.79) was first in the 2 Mile, Jack Gangemi topped the shot put at 34-00.00, Jack MacAdam came in first in the high jump at 5-05.00 and Kalil Matier was best in the long jump at 19-01.50. Milford’s Cam Clark won the 55M race at 7.08, Jared Luce took the 600M race at 1:33.26 and Luis Goncalves was first in the 55M hurdles at 8.91. Attleboro, 16 vs. Franklin, 84 – Final – Franklin’s Jessica Kroushl came in first in the 55M dash at 7.71, the 300M race at 43.54 and the long jump at 16-02.25. Meghan Doherty had a league-best time of 1:43.55 in the 600M, Brittany Robinson (league-best 3:14.00) and Sabrina Roche (3:16.13) came in first and second respectively in the 1000M, Ella Gutkowski grabbed first in the 1 Mile in 5:56.82, Sarah Goodermuth was first in the shot put at 28.02.25 and Lauren Farnan was first in the high jump at 4-07.00. Attleboro’s Quincy Harding took first in the 55M hurdles at 9.72 and was second in the long jump at 16-00.00. Canton, 39 vs. Sharon, 61 – Final – Ariadne Tolay finished first in the 600M at 1:44.91, sophomore Amanda Brown (3:29.86) was first in the 1000M, Heather Seggelin took first in the 1 Mile at 5:55.67, Maria Gieg was first in the 2 Mile at 12:35.04, Brigid Loftus won the 55M hurdles at 10:08 and freshman Geena Lesser took the high jump at 4-07.00. Canton’s Selena Cho won the 55M (state qualifier 7.87), the 300M (54.78) and the long jump (state qualifier 15-04.25), Kelly Dever won the shot put at 28-03.25 and Hannah Link came in second in the 300M and third in the 55M in her first track meet. Foxboro, 68 vs. Stoughton, 32 – Final – Foxboro’s Shraeya Srinivasan was first in the 55M at 7.76 and the long jump at 16-08.50, Berlendah Dure was first in the 300M at 44.86, Meredith Cronin (league-best 5:36.46) came in first in the 1 Mile, Lexi Quinn was first in the 2 Mile (12:14.09), Marina Wright was first in the 55M hurdles at 10.13 and Kelsey McDonald was first and tied for a league best 4-11.00 in the high jump. Stoughton’s Marissa Williams claimed first in the 600M at 1:58.71, Julia Bobeck was first in the 1000M at 3:36.76 and Nashadee Guerrier got the win at the shot put at 29-09.00. King Philip, 40 vs. Taunton, 60 – Final – Taunton’s Jill Purtell was first in the 55M hurdles at 9.65 and in the long jump at 16-10.25, Sam Tichelaar got the win in the 55M dash at 7.85, Leishnaly Rosado came in first in the 300M at 45.74, Samantha Grundy was tops at the 1000M at 3:20.89 and junior Amanda Baptiste (12:52.78) and eighth grader Tatyana Mainer-Smith (12:55.76) came in first and second respectively in the 2 Mile. King Philip’s Lucy Hamilton got a first place finish in the 600M at 1:46.91, Sarah Butts won the 1 Mile at 6:19.45, Emily Cote was first in the shot put at 27-07.50 and Abigail Mckeown finished first in the high jump at 4-09.00. Mansfield, 46 vs. North Attleboro, 54 – Final – In the tightest meet of the day, North Attleboro was led by a first place finish in the 2 Mile by Ann Roberts (league best 12:06.23), a win at the shot put from freshman Julia Mechlinski (30-06.50), a first place finish from senior Nicole Boulanger (tied league best 4-11.00), and a first place finish from Isabelle Renzi in the long jump at 16-10.25. Mansfield’s Lauren Waters had a league best finish at 7.58 in the 55M dash, Kelly Crawford had a league best time of 42.41 in the 300M, Rachel Stier had a first place finish in the 600M at 1:46.96, Caitlin Whitman finished first in the 1000M at 3:17.00, Emma Oldow had a first place finish the the 1 Mile at 5:56.08 and Alicyn McHugh finished first in the 55M hurdles at 10.45. Milford, 33 vs. Oliver Ames, 67 – Final – Sophomore Elizabeth Nuss got the win for the Tigers in the 55M dash at 8.11, Lauren Wright came in first in the 600M at 1:44.62, junior Dana Lowney, junior Jessica Robarge and senior Erin Fitzgerald finished 1-2-3 in the 1000M, Gabby Eldridge was first in the 55M with a league-best time of 9.47, Chi-Chi Akanegbu was first in the shot put at 35-10.50 (league best) and Comfort Udo came in first in the high jump at 4-09.00. Milford’s Gabby O’Neil was first in the 300M race at 46.42, Jenise Madden (5:50.23) was first in the 1 Mile, Gabriela Chong (12:41.61) was first in the 2 Mile and Christina Speliakos was first in the long jump at 15-11.00. 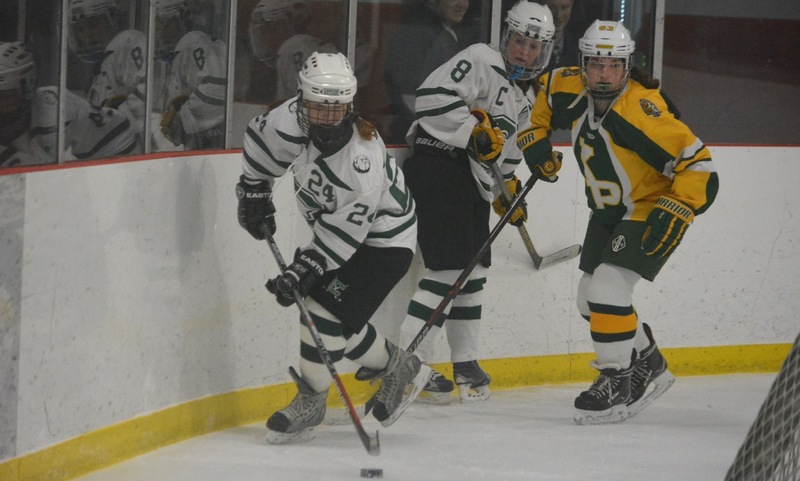 King Philip, 3 @ Norwell, 2 – Final – Molly Alfond, Olivia McCarthy and Casie Curtin scored for the Warriors.